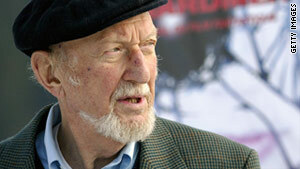 Irvin Kershner died Saturday at his home in Los Angeles, California. Kershner directed 1980's "Empire Strikes Back"
He directed stars including Sean Connery in Bond film "Never Say Never Again"
Los Angeles, California -- Filmmaker Irvin Kershner, who directed the 1980 Star Wars sequel "The Empire Strikes Back," died Saturday in his home in Los Angeles, California, after a three-and-a-half-year battle with lung cancer. He was 87. In his 40-year career in film and television, he worked with several screen luminaries. In the 1960s and 70s, he directed Robert Shaw in "The Luck of Ginger Coffey," Sean Connery in "A Fine Madness," George C. Scott in "The Flim-Flam Man," Eva Marie Saint in "Loving," Barbra Streisand in "Up the Sandbox," Richard Harris in "Return of a Man Called Horse," and Faye Dunaway in "Eyes of Laura Mars." He also directed Connery as James Bond in "Never Say Never Again." In 1969, Kershner teamed up with novelist John Irving for a screen adaptation of his novel "Setting Free the Bears." In his 1999 memoir titled "My Movie Business," Irving called Kershner his "hero." "He was a wild man with a non-stop imagination and boundless energy. I just tried to keep up with him, which wasn't easy," Irving wrote, according to Kershner's publicists. "Kershner never sat down. He paced, reciting the entire story, from the opening shot to the end credits, without once referring to the script. Kershner was the real screenwriter. I was just taking dictation." Kershner's career began with the study of music and art. He studied at the Settlement Music School in Philadelphia and Temple University's Tyler School of Fine Arts. Then he became a student under the famous painter Hans Hofmann in New York. He moved to Los Angeles and studied photography at the Art Center College of Design. He began his film career at the University of Southern California's School of Cinema where he taught photography and took cinema courses under Slavko Vorkapich, a montage artist who was also the cinema school dean. In June 2010, Irvin Kershner received a lifetime achievement award from the Academy of Science Fiction, Fantasy and Horror Films. George Lucas, creator of the Star Wars trilogies and executive producer of "The Empire Strikes Back," praised Kershner at the time of the award. "(Kershner's) films have a maturity and a depth of character, and that's just what my middle chapter needed. The Star Wars story has had to evolve in order to stay fresh, and it took a filmmaker like you to make that important step in galaxy-building," Lucas wrote. Director Francis Ford Coppola, a long-time friend, described Kershner as "indomitable." "We all enjoyed knowing Kersh, learning from him -- and admired his creative spirit and indomitable will," Coppola said in a statement released by Kershner's publicists. "It was always exciting to talk with him about all aspects of cinema and life." Actress Barbra Streisand was a friend of nearly 40 years. "He had the most incredible spirit, an exuberance for life. Always working, always thinking, always writing, amazingly gifted and forever curious. We met doing 'Up The Sandbox' in 1972 and remained friends ever since. I loved him," she said in a statement. "Empire Strikes Back" star Billy Dee Williams described Kershner as "an extraordinary mountain of a man with whom I'm proud to have shared the world of art." "I bet he's smiling at us right now with that wonderful impish smile," Williams said in a statement. iReport: Remembering Kershner as a "legend"
In later years, Kershner continued to produce and write, while teaching screenwriting at the University of Southern California and lecturing in many countries. He also created a collection of fine-art photographs for exhibition in New York, San Francisco, and Mexico. Some of his work is now a permanent photo exhibit at the newly opened Los Angeles County General Hospital. "Kersh was a truly gifted, devoted, and generous mentor to all who had the privilege of working with him," said James Ragan, friend, poet, and former director of the USC Professional Writing Program. "His film co-workers, students, and friends alike knew him as a gentleman, a student of film and human history. He loved teaching, whether on a set or in a classroom. He had a sense of humor to match his unwavering commitment to high standards." In September, Kershner told his son David that "you have to throw yourself into things. There is no second way. Passion gives you energy." David Kershner said his father never really retired. "He had a powerful drive to create--whether it be through film, photography, or writing. At the time of his death, he was co-writing a Broadway musical entitled 'Djinn' and working on a documentary about his friend Ray Bradbury. The musical is a fable about tolerance and a deep bond of friendship between a Jewish immigrant and an Arab sheik, set in a Palestinian village prior to the birth of Israel," the son said. Matthew Robbins, writer, director, and former assistant to Kershner on the film "Loving," said Kershner was known for his enthusiasm, sly sense of humor, and generous criticism. "To many, he represented the best in what American film making could do with its enviable resources and catholic traditions," Robbins said. "He believed in emotion as the basis for all dramatic storytelling. For him, the worst cinematic crime was flatness, or lack of feeling. "Few who encountered Kershner either on the set or in the classroom will forget his almost ruthless pursuit of honesty and recognizable, complex human motivation," Robbins said.